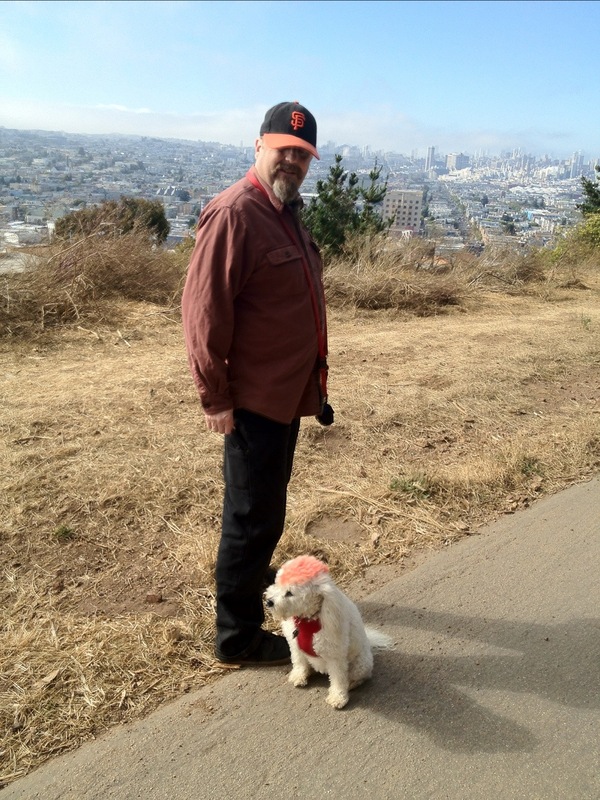 One of the reasons i love San Francisco but especially Bernal Heights…. 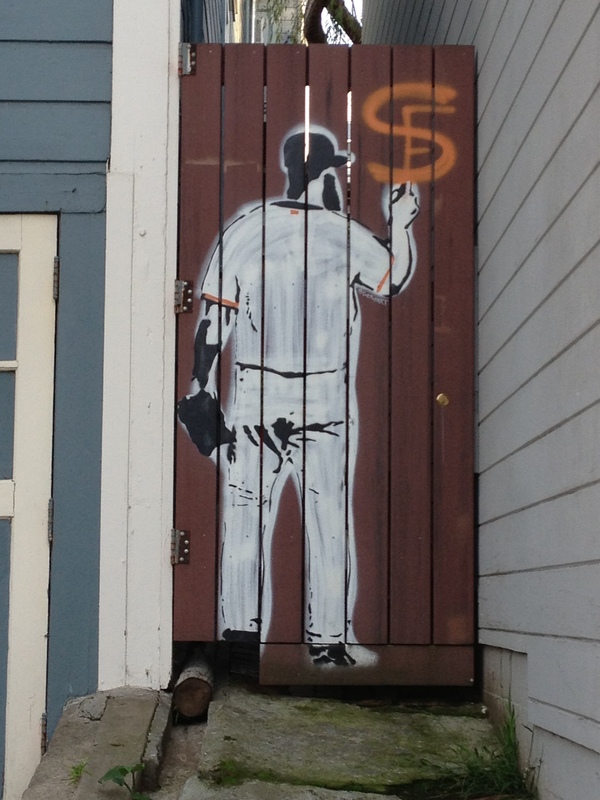 Stencil of SF Giants pitcher Brian Wilson. Graffiti PURPOSELY PLACED on a home on the west slope of Bernal. I believe that our neighborhood has either 3 or 4 of these stencils up. They are done by an artist from Oakland (aka the old sf! )… Hopefully Wilson will have completely recovered from the Tommy Johns surgery and he is impressing Bocce a LOT… enough for us to offer him a competitive contract. Because at this point, Mr. Wilson is a free agent. How could we lose the beard that we all should fear?? What will i wear on game day??!! Dilemmas! Oh well, i am going to enjoy my bearded misfit champion team with Brian Wilson a part of the mismatched symphony of players and hope for the best! our SF Giants are truly our Halloween super stars and the MLB World Series Champions in a complete sweep! GO GIANTS!! SF Giants 2012 World Series Champions! Today i wake up the fan of the 2012 World Series Champions in sweet San Francisco. When we won in 2010, the city was electric. We had waited over 50 years to win the championship and it was the first win since their move out of New York. We had waited DECADES for that win and for those of us that have been lifetime Giants fans from the days when their record was not so strong and you had to freeze your behind off while paying $16 for bleacher seats at Candlestick Park to the super plush brand new winning record playing at SBC Park, the win was long overdue so, needless to say, that was very exciting! However, here we are in 2012. Just 3 seasons apart so the buzz of the 2010 win was still fresh and on (at least my) mind still. Felt like it just happened yesterday. But then i remember that last season, we lost Buster Posey to an injury early on in the season and we had not acquired several of our teams outstanding players yet to bring us to today… The perfect team. The team of winning misfits. I feel a little bit like the Giants represent what San Francisco used to be like more than it seems to be like today with their oddball characters and support through the diversity. A well deserved moment of victory between Buster Posey and Sergio Romo. Today, EVEN without Brian Wilson as one of our secret (not so) weapons, our San Francisco Giants 2012 postseason team may be the most epic eclectic group of talent that exists in baseball today. From our MVP and one of the fan proclaimed mascots of our Panda (Pablo Sandoval), to Marco Scutero’s coming on strong when we needed him to and , of course the most epic all around player and maybe the league’s best catcher they’ve ever had Buster Posey, to the super intense Angel Pagan and super fast Gregor Blanco, to our new oddball and inspirational addition to our team Hunter Pence, and our local boy Brandon Crawford, …to our amazing pitching staff. Lincecum, Cain, Bumgarner, Adfelt, Voglesong, the VERY deserving Barry Zito and the most awesome Wilson replacement closer Sergio Romo. (Maybe it was the power of those dimples that made each close like lightning). Regardless it was the perfect storm of come behind kids to world champ sweepers. It is interesting that the Detroit Lions swept the NY Yankees and then we swept Detroit. We were on a roll that no one could stop. We fixed our glitch of being able to win post season at home and we were able to hold off any chance the Lions had of catching up by playing such tight baseball. It was such an exciting post season, from the come from behind win with the Reds to the absolute tromping of Detroit, it was definitely the fan’s dream season. It should be an AMAZING team next year with Wilson back on the roster and Milkey out of restriction. I personally can not wait to watch. I know this type of win often leads to mass hysteria and sometimes self destruction of their own winning city. I never understood why this extreme happiness ends up in vandalism and destruction of their own city. But, that is of course, what happened last night in the Mission. Mattresses were set on fire (again! ), city streets were flooded with people and shut down, and i even heard that they had a bus in SOMA that had a single passenger inside, where people had surrounded it and were on the roof jumping up and down and people around it pushing it from side to side. It must have been utterly terrifying! Why would we do this to another possible Giants fan and at least a SF visitor or resident? We vandalized our small businesses and generally trashed our city. So i guess there are a lot of rebel idiots left in San Francisco unless they (probably) came in as a bridge and tunnelers. That would make more sense for outsiders to get wasted and trash NOT their city. Regardless, i wish the citizens and fans in SF could try and show as much class and grace as our players and manager Bruce Bochy always do. We need to work a little bit harder to show the same level of class as the team that incited that reaction in the future if you ask me. And, i have to give big props to the Detroit Tigers who put on a good series even though they never were able to get a footing. Their GM interviewed after the loss spoke with more generosity, humility and class to the point that i felt that we were playing the right team. Both teams were and are class acts and both deserved to be in the world series. Detroit although did not win, did play a damn good season and will also be a team to watch again next year. Regardless, SF Giants pride is brimming here in SF. We can’t seem to win a World Series game at home, but we don’t care here in San Francisco! We await the victory parade which will take place on Halloween morning at 11:00 am. It sure makes a last minute Halloween costume of being a giants fan an easy one! 😉 (We could just say that we came strait from the parade.) However, i have a feeling that because these two events happen on the same day, we may see a new creative angle on the costumes that will grace our town. (for instance, a friend of mine is planning to be an orange Darth Vader with a SF Giants flag as the cape. Dont steal the idea SF or i will not share these secrets in the future! ;). San Francisco City Hall lit in orange in honor of becoming the World Series Champions of 2012! 10,000 people descended upon Civic Center plaza to watch and celebrate the SF Giants final game of 2012. It will be a SUPER holiday on Wednesday October 31, 2012. A holiday that is as perfect of a storm as Hurricane Sandy may turn out to be. Only not in a scary way, but in a joyous and cosmic way, having our Halloween team be honored on Halloween! We were not always the Halloween team because in 1989, we were in the world series in the middle of October instead of the end of October (remember that day with the battle of the bay that the earth shook?) We think that the season had to be extended because teams had been added over the years making the season a little bit longer. Our San Francisco Giants deserve all of the love and honor they have coming to them on Wednesday. They are a GREAT team! I personally think the best team we EVER have had. In part because we are the team of the misfits that came together to create a force that was good enough to win it all. CONGRATULATIONS SF GIANTS!! YOU HAVE MADE YOUR CITY OH SO PROUD YET AGAIN! THANK YOU FROM THE BOTTOM OF OUR HEARTS! We cant wait to see what we can do next year, but now, a well deserved rest i have a feeling is needed. Until next season…. We are current WORLD CHAMPIONS yet AGAIN!! WOO HOO! WAY TO GO GIANTS!